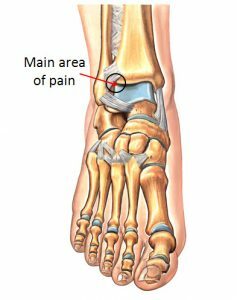 Typical Symptoms; Typically a slow progressive stiffening of the joints (especially the big toe) with a dull constant pain and swelling. 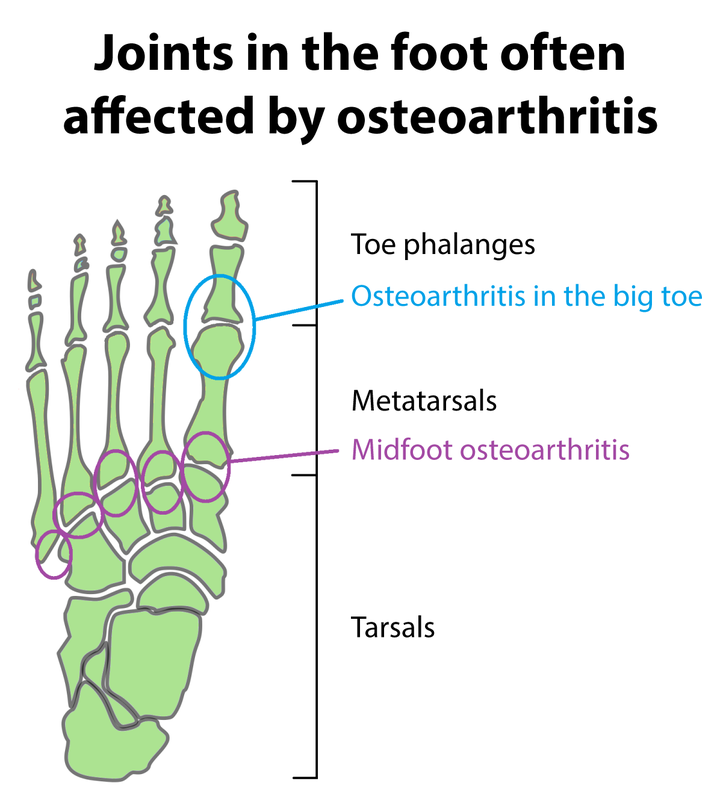 Osteoarthritis (OA) causes cartilage in a joint to wear down. Cartilage is basically a material that lines bony surfaces in joints. It helps prevent friction and fundamentally acts as a ‘shock absorber’. When cartilage is compressed it can deform and change shape due it’s high water content. Although it can undergo a degree of repair once damaged the body does not grow new cartilage. Pain in OA occurs because bony surfaces make contact with one another as the cartilage degrades. 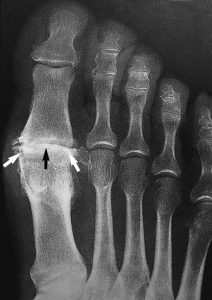 OA can affect any of the 33 joints in the feet, but the most common site is the base of the big toe. This joint is more prone to wear and tear because of its significance in the gait cycle as you walk. Most of the force is generated from and attenuated by your big toe joint as your foot pushes off and lands as you walk. The forces absorbed during walking over time, especially if you roll your foot excessively inwards as you walk (over-pronation) can cause the cartilage to erode. Eventually your big toe may become much less mobile (a condition known as hallux rigidus) which makes walking difficult. Alternatively, your big toe may drift towards your other toes (hallux valgus) and this can lead to bunions. 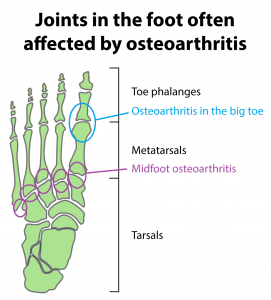 There is also a significant amount of force that crosses the joints in the middle of the foot (known as tarsal bones) as the foot propels us forward during walking or running. If the cartilage wears in these bony structures that comprise your midfoot, this can generate pain as bones starts to rub against bone. Typical Symptoms; Pain at the front of the ankle especially when the foot is forced upwards into dorsiflexion. 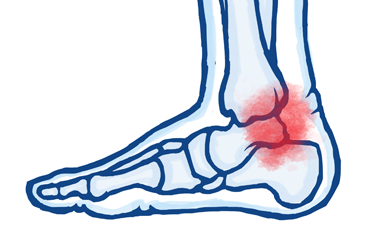 Anterior ankle impingement is a common problem that is typified by pain at the front of the ankle. This pain is typically exacerbated by moving your foot upward (dorsiflexion). The ankle joint comprises two bones called the tibia and talus that glide over and articulate with one another during movement patterns such as walking and running. Like all joints they have cartilage that helps cushion movement as they correspond with each other during weight bearing activity. During these movements the ankle approximates with the shinbone in a movement called ‘dorsiflexion’ (so effectively the foot and shin move towards one another). This generates compressive forces at the front of the ankle joint. This can characteristically be tolerated but if these forces are excessive (common in some sports or in dancers especially) damage can occur that causes impingement of the joint capsule at the front of the ankle. If this compression continues it can result in bony spurs forming as a result of the cumulative repetition. Treatment can be conservative. Recommendations can be made regarding footwear choice, activities can be restricted and the ankle can be taped. More severe presentations may require surgery in order to remove a bony spur.